SOUND AND MOVEMENT: Display the ornament on your tree or on the base provided. 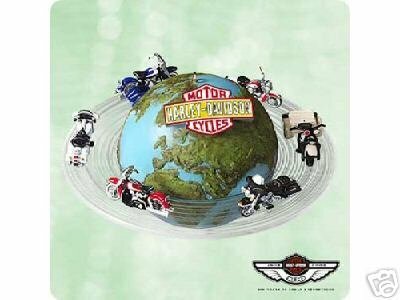 To hear the sound of an authentic Harley-Davidson motorcycle engine and see the ring of motorcycles circle the globe, press the Harley-Davidson nameplate on the globe. Requires AC/DC power adapter (included.) SOUND ONLY: Requires battery ( included). Complete instructions enclosed. Designed by Dan Palmiter and Chris Webb ~~ Die-Cast Metal and Handcrafted - Dated 2003. Diameter of ring 5". Mint in mint box, never played with or displayed. New,mnt in mint box, never used. 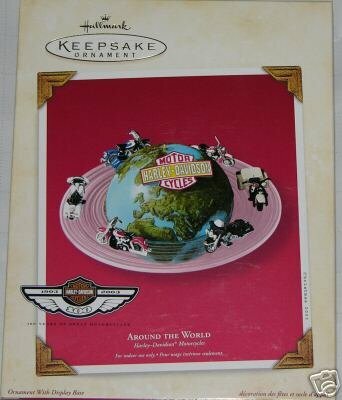 Items Similar To "Harley Davidson 100th Anniversary AROUND The WORLD Hallmark 2003 ..."